I read a lot of cooking blogs because I'm always interested in expanding my range of cooking skills. There was a time, for instance, when I was trying to master the art of making a really good steam cake. One of the Chinese recipes said something to the effect of, 'We Chinese traditionally ate fruit after meals for dessert, but, ha, ha, Western cuisine has corrupted us.' Every time I read something about how Western food culture has harmed the "healthy" Asian food culture, I get a little peeved. You can lead a horse to water, but you can't make him drink. If Asians prefer to eat healthy food, no exposure to bad Western habits is going to force sugar, refined flour, etc. down their gullets. If they embrace unhealthy food, it's because it's what they want to eat, not because we made them consume it. They're no more superhuman than the rest of us when it comes to resisting highly palatable food. I also frankly have my doubts that a culture with dim sum couldn't figure out that adding sugary elements to its basic stuffed buns wouldn't be a good idea for a sweet finish without our bad influence. I credit them with having just that little creativity with their own homegrown cuisine. I think they likely figured that out on their own, but we always get blamed for everyone's bad habits... such is the burden we bear based on our generally pretty terrible eating habits as a country. We get blamed for all food crimes, not only the ones we actually committed. All of that being said, I think we'll have to take the hit for Bloomin' Onions entering the junky and junk food time stream in Japan. They do have their own fried food culture (with tempura and all), but we're the ones who overdid it with breading and size. I honestly didn't know Outback Steakhouse even existed in Japan until several months ago when my brother-in-law (who still lives in Tokyo) posted pictures of a Bloomin' Onion he'd consumed as part of his birthday. And, yes, I know the old Outback is an American notion of "Aussie" cuisine. They're more about the meat pies and the vegemite than the over-sized steaks and bread served cruelly stabbed with a knife. I'm guessing, possibly incorrectly, that the Outback may be getting a toehold in Japan since this type of snack would need a reference point for those who purchase it. 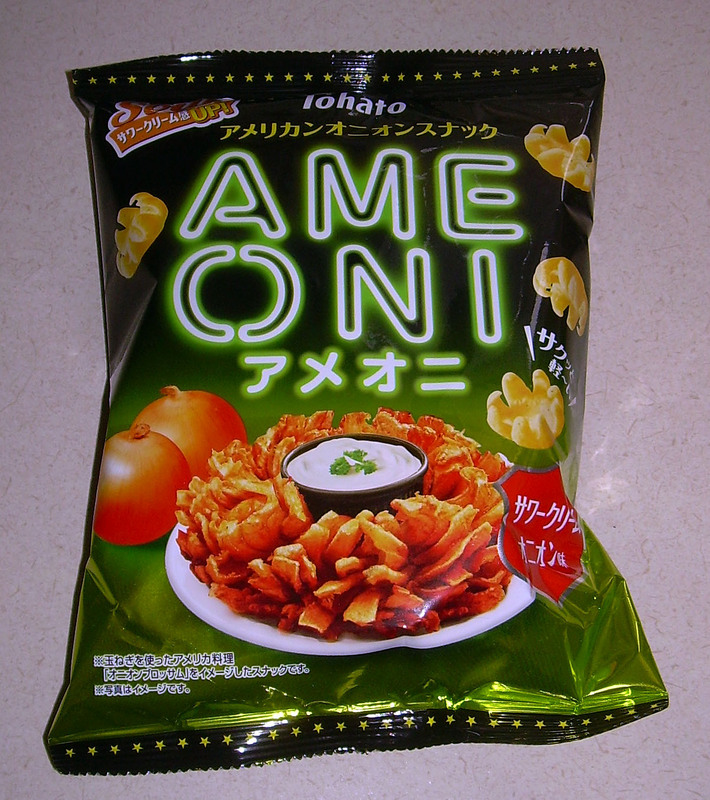 Otherwise, the (misleading) picture of a fried onion flower on the bag would confuse rather than entice. I can say that it honestly enticed me. I think they look less like Bloomin' Onions and more like low level sea life, but that's just my impression. When I opened the bag and gave it a whiff, I got a very strong sense of sour cream. 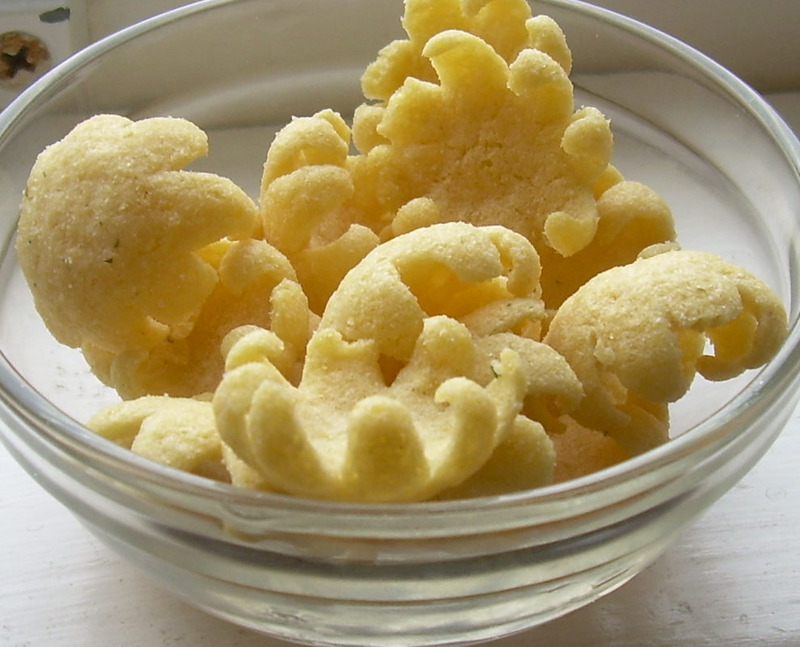 The little snacks themselves are very light and crispy, but have a "soft" rather than a hard crunch. That means they are airier than a dense crunchy snack food despite also being quite thin. When I bit into it, the sour cream was on the front end followed by a whisper of onion and a finish of corn. The onion component becomes stronger as you eat more and it lingers on the tongue. I'm guessing this is how they justify calling them "Boomin' Onion" snacks because they otherwise don't have anything to do with the Outback Steakhouse calorie bombs they're named for (shape of the little cups not withstanding). I liked these. I'm not sure how much I liked them. I was glad to have them and enjoyed eating them, but I don't know if I'd buy them again. My husband loved them and I think he would be inclined to buy more if we could easily get our hands on them. I liked the flavor complexity that came through in such a relatively pedestrian snack. I think he just liked the salted, sour cream flavor and light crunch. For both of us, this was a winner.